In April 2006 Grant and I took a trip back to Georgia to see my family (and to see some of the Tour de Georgia). In Helen, GA, after a three hour road ride, in my sweaty spandex, helmet and awkward bike shoes, Grant stopped beside a stream, knelt down on one knee and offered this beautiful ring to me. And, this wasn’t any ring. This ring had been made with love by my best friend, Preston. Grant, who had never even met Preston, called him up months before he asked for my hand in marriage, and asked my best friend to make this beautiful ring for me. Even to this day, when I catch a glimpse of this ring on my finger, it feels me with so much love. My husband has always been sentimental and thoughtful, and it’s one of the reasons why I love him so much. Just 11 short months later, we were married. Planning a wedding, as many of you brides out there know, is no easy task. At the time, I was just starting to enter the photography field, but still, the first question I got was “Who is going to shoot your wedding?” It was funny, I never shopped around. Not once did I consider choosing anyone but Cameron Clark (now of Cameron Kelly Studios). I was in love with her style, her ability to tell a wedding story, and her dedication. Now, eight years later, I’m so glad that I went with Cameron. Putting this blog post together, to celebrate our eighth year anniversary, has made me appreciate the importance of great wedding photography even more. Every photo brings back a memory, a tear, a laugh and a story. Thanks Cameron. Now, I wasn’t a very compliant bride. Just ask Kim Duncan of KD Event Designs. Just three weeks before my wedding, I didn’t even have a wedding dress. I didn’t have a theme, colors or know anything other than I just wanted to walk down the aisle. Kim, literally, saved my day. Kim was just starting her business when I roped her into “helping” (and by helping, I mean taking over). And it wasn’t easy; we decided to get married in an aesthetically challenged reception hall. To put it bluntly, there were about 15 Elk heads in the reception hall . But, it had a meadow that viewed the San Francisco Peaks, and that sold it to me. Kim pulled everything together for me, not only quickly, but managed to make it beautiful and meaningful. She took our love of bird-watching and added it to the tables, brought beautiful earthy tones of purple and tans into the mix and even splashed purple irises around the room so that I’d feel my mom, who passed when I was a kid, around me all night. (Mom always had a beautiful iris garden growing up) Thank you Kim for making our day everything that we had hoped! When the day arrived, we found ourselves surrounded my so many people that we loved and so many family members that had traveled great distances to join our little celebration. I remember getting ready at the England House Bed and Breakfast and just trying to take it all in. My beautiful dress, given to me by a sweet friend from GA, hung on the door and couldn’t have been any more perfect than if I had searched all over the world for it. My dear friend, Donna Shoemaker, did my makeup and also assisted Cameron later that afternoon. Sitting and laughing with the girls and Preston (who was a brides-man) still remains some of my fondest memories. Now, every wedding has its funny moments. And this one still cracks me up. In my earnest to pinning a gardenia corsage on my step-mother, I stabbed my thumb with a floral pin. And by stabbing, I mean it was so far in my thumb that I couldn’t get it out. My brother, Tim, saved the day, and managed to doctor me up so that blood wouldn’t spill on my dress. we could live on bread alone. My dear friend from college, Cindy, read one of our favorite passages, and Grant’s cousin, Kenny ( who was a professional opera vocalist), sang my favorite John Denver song, “For You”. Kim choose delicate hydrangeas and stock for the bouquets, and used vintage Audubon bird drawings as table names. Derrick, one of the groomsmen, crafted the aspen print holders. The birds, found through out the room, were from my ornament collections that I had collected over the years. And while there isn’t a great photo of it, even our dear friend TC helped us by building a last minute aisle out of plywood so we wouldn’t have to walk through the mud. When it came time for the toasts, there was not a dry eye in the house. TC surprised us all by delivering his entire speech with a Southern accent, which he promptly blamed on Preston. Preston took it in stride and took it as a compliment. Speaking of toasting, brings up my only regret for the day. I wished we had hired a videographer, if only for moments like toasting. My Dad speech was so sweet and sincere that thinking about it to this day still brings tears to my eyes. What I wouldn’t give to hear my father deliver his speech one more time. Our ice-cream cake was topped with a present from Kim, a handmade tandem bicycle. What a sweet surprise and nice way to celebrate our hobby! Grant and I took ballroom dancing lessons for six weeks for our first dance. It turns out that Grant is a fantastic dancer, and I, well, I have control issues 🙂 But, he got me though it and we had a great time. I choose the song “Misty” to dance with my dad. I played the piano as a child, and that was his favorite piece that I knew. We ended up singing to one another during the dance, and I love the photos of that. Dad passed away last month and now these photos of he and I mean so much more to me than I’d ever realize. When I sat down to write down some goals for 2013, which I do every year in the first week of the year, completing this program, The Artist’s Way, was in the top five. For those of you unfamiliar with the book and program, it’s a 12 week program to recover your creativity from a variety of blocks, including limiting beliefs, fear, self-sabotage, jealousy, guilt, additions, and other inhibiting forces, replacing them with artistic confidence and productivity. I’ve started the program once before in late 2011, but when the assignments got tough, and required me to dig a little deeper, I abandoned it. I started critiquing all the crazy ideas and thoughts that came from within. I convinced myself I didn’t have time for it, and put the book on my nightstand, where it sat, unopened, for over a year. I don’t think I was quite ready to look inward, to really breathe in and listen to what was in my head. I started the program this morning with the “Morning Pages” (three pages of longhand, strictly stream-of-consciousness writing), and found myself writing not the required 3 blank pages of free writing, but six. It seems that I have quite a lot bottled up in my head. It was quite the release to put all the crazy thoughts on paper, in no reasonable order, and then walk away from them. 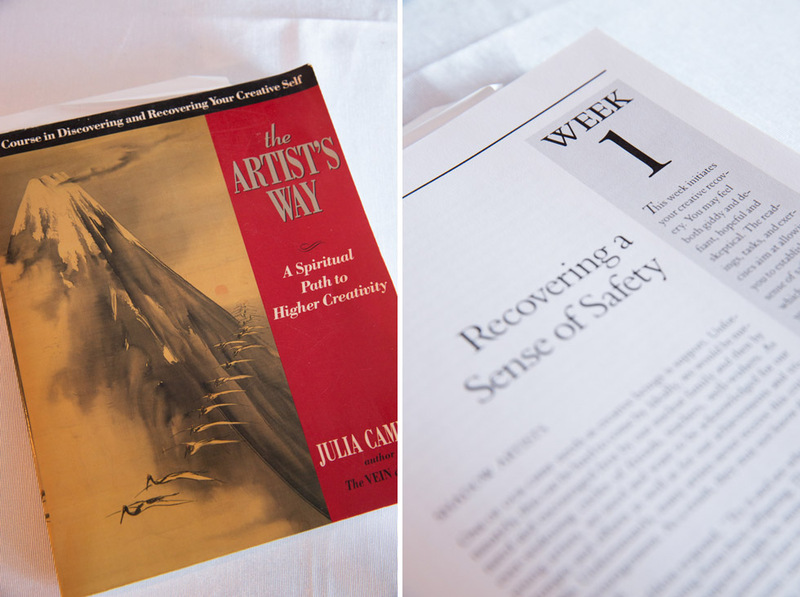 The first week centers on facing fears associated with being in the creative field. And let me assure you, I have lots of fears. This week is going to be hard for me. I hope to share with you glimpses of my journey as I meet this challenge. I’m certain some of it will be funny, some sad and tragic and some will be a triumph. I cannot wait to dig in deeper and hopefully, release my creative self that lies within. Being a photographer is one of the most amazing things I’ve ever been able to do, but running a small, growing business has taken so much of my creative energy. I know completing this course will renew my spirit and my soul. Join me if you will! I’d love the company. 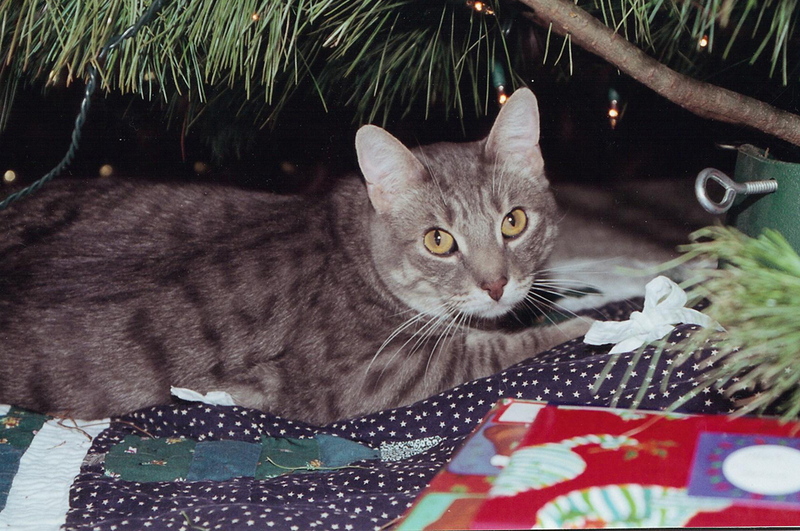 Fourteen years ago I fell in love with a silver tabby kitten. It was a hot summer day in July of 1998 and I was living in Bullhead City, AZ. I went out to take the trash can to the curb and I heard a soft “meow” noise from the front yard. I stopped in my tracks when I realized, to my surprise, someone had discarded seven very young kittens. As I was cursing this horrible person, I picked them up and brought them into our house. Kittens! Who could do such a thing? They were all so skinny, and so dehydrated from being out in the 120F+ heat. They all lapped up the cool water very quickly and were devouring the cat food I had offered them. In the next 48 hours I looked after them carefully, and tried to formulate a plan to find them homes. At the time, Bullhead City didn’t have an animal rescue organization and from the volunteer work I had done, I knew that taking them to the Humane Association would likely be a death sentence for these sweet souls. So, I decided to find them all homes myself. 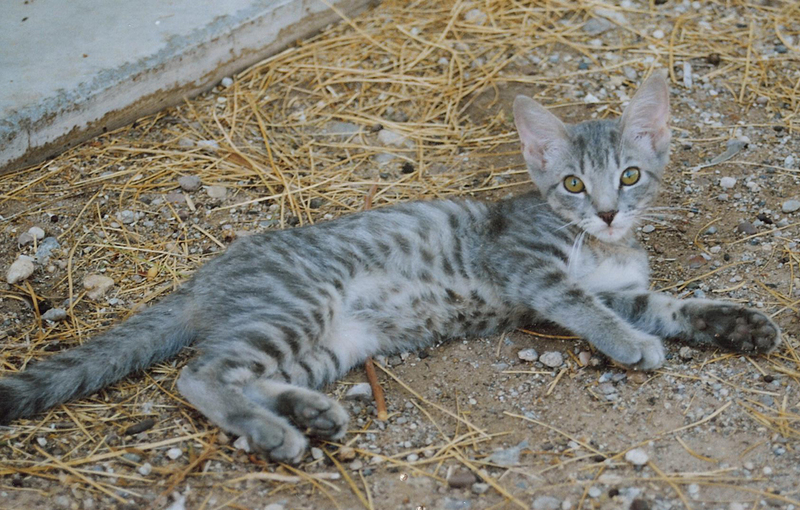 I worked in the medical community at the time, and I made a few homemade posters of the kittens, with individual photos of them, and placed them around the hospital. Day after day, people came to our house and looked at our beautiful kittens. One by one they were adopted, except for the one we had come to call “JoJo” (Short for Joseph Johansen). Now this really perplexed us. JoJo was the only one that we had named, and it was because he was quite a character. At only 8-10 weeks old, he would chase our FOUR large dogs around the house and tease and play with them relentlessly. He would jump on our heads in the middle of the night, and his antics had our entire household laughing uncontrollably. He was definitely special. He never found a home because of one thing…every time someone would come to the house to see our kittens, JoJo was no where to be found. I had been adopted by JoJo. At the time, I had two other cats, KelseyKai and Luke. JoJo tried to charm them, but they were not quite sure about this kitten with so much energy and so much personality. There were a few cat arguments but JoJo finally won them over. And, that winter, I quickly found out JoJo’s favorite time of year, Christmas. Once a year, in JoJo’s eyes, the most astonishing thing would happen…a magical tree would appear with cat toys draped on it! It was, of course, our Christmas Tree. The first year, JoJo must have taken off every ornament on our tree to play with it. After that first year, however, he resigned to only removing the lower ones, while he sat under the tree and gazed at the lights. Christmas always makes me think of JoJo. I hope it always does. The years brought changes, and in 2001, I found myself in Flagstaff, AZ with my four animal friends. In 2003, we bought a 1970s gem, just north of the hospital. To call it a “fixer-upper” is an understatement but we thought it was perfect. It was home. JoJo’s favorite thing about the house was the deck. On sunny days, he would lay in the sunshine outside, and when snow covered the ground, he would find the sunny spot inside and bask there. His favorite toy was a feather attached to a fishing pole. He would amaze us with jumps as high as five feet! In 2006, JoJo gained a dad who adored him, my now husband, Grant. Later on in that same year, although healthy otherwise, JoJo lost his sight. We were frantic at first, but quickly came to realize that he got along just fine without his vision. He became a bit more cautious when he jumped on the furniture and I noticed he walked a little more deliberately, but his ‘handicap’ didn’t phase him at all. He still jumped for that feather as high as he could! One day, he brought me a special present, a headless mouse. I know JoJo was very proud as he rubbed against my legs when he presented it to me. I never knew how a blind cat could hunt for a mouse. But, as my friend Kelley said that evening, “Maybe it was one of the Three Blind Mice?” Those words still make Grant and I laugh out loud. Sweet JoJo, thank you for thinking of me. JoJo also had a few other super powers. Despite his blindness, he could sense a lap while it was in motion of being formed. Our friends would always marvel at how our blind cat would appear from nowhere as soon as they sat down on our couch. He also could tell when I was about to open the refrigerator to get some yogurt. But, yet, he would not appear when I was getting something else out. I honestly don’t know how he did it. He LOVED yogurt, maybe even more than he loved laps. Well, maybe not that much. He also had a skill of finding the sunny spots and would follow them through the house all day. JoJo was a lover. He had some special animal friends in his life, but I think his BFF was definitely BobKitty. BobKitty was a stray who came to live with us about 3 years ago. I think JoJo felt his stress and loneliness and he quickly befriended him. From the time BobKitty came to live with us, to the day that JoJo passed away, those two were together. On the morning after JoJo’s passing, BobKitty just sat on the chair that JoJo and he used to share for their morning nap. It broke my heart as I saw him look around for his friend. JoJo’s final days were very hard for all of us. Despite all the veterinary care we could offer, JoJo’s body was just worn out and this past Saturday, he joined KelseyKai and Luke in heaven. Like BobKitty, I find myself looking for JoJo when I get up in the morning and am saddened when I remember that he’s gone. I miss his purrs and I miss him putting his paw on my heart. He would do that when we would cuddle together. During his last few moments on earth, his paw was right there on my heart. I think it was his way of telling me that he’d always be with me. JoJo, thank you for choosing me as your mom 14 years ago. Thank you for loving Grant and I so much. Thank you for your kindness to all the other animal friends who lived here. Thank you for your bright light that you shared with everyone you met. Some people say I rescued you, but we both know it was the other way around. You gave me love, laughter and kindness when I needed it most. Enjoy heaven my sweet boy, and, I hope, the bottomless bowls of yogurt, warm laps to cuddle in and sunny spots abound.